As I'm sure you can tell by now, summertime is my absolute favorite time of year. Being outdoors all day and night, going for swims in the lake, taking walks along the waterfront, and enjoying a glass of wine on a patio with a beautiful view... I honestly can't think of anything better. And so, with my love for all things summer, what better place to visit for a romantic getaway with my man than the land of summer itself? Summerland! For those of you not from BC, you may never have heard of this place, but it truly does exist. It's just a 4 hour drive away from Vancouver (when Ollie's driving) so it makes for the perfect weekend escape. 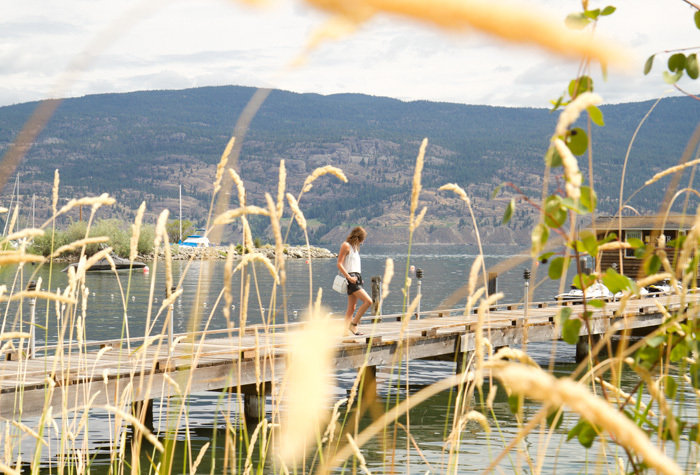 It's right in the Okanagan amongst the beautiful wine region and it truly doesn't get much more beautiful than this. 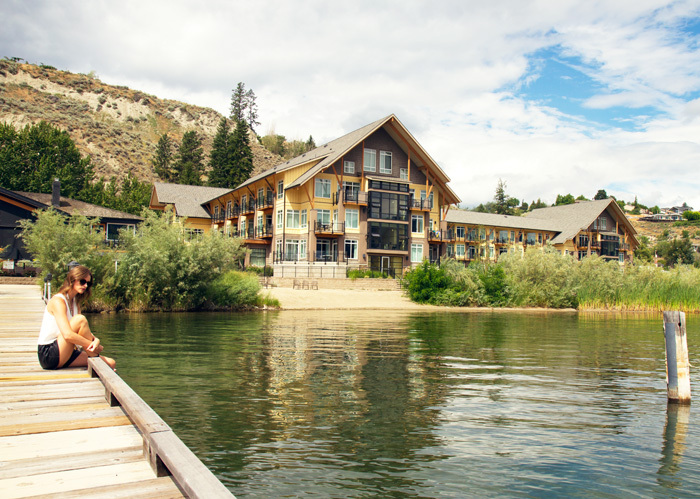 Ollie and I were invited to stay at the Summerland Waterfront Resort and Spa for 2 nights and so we headed up on Friday night to take advantage of this stunning resort. The first thing that we did once we woke up was explore the area surrounding the hotel. There's a huge long dock right out front, where you can rent boats from, and a path that goes along the lake for about a kilometer or so from the resort. There's a natural marsh along the path and apparently you can see beavers there sometimes -- of course, we weren't that lucky but we did get to see a turtle and lots of beautiful birds so I didn't feel too let down. I love when a resort incorporates the surrounding nature within its design and uses the beauty rather than compete with it. 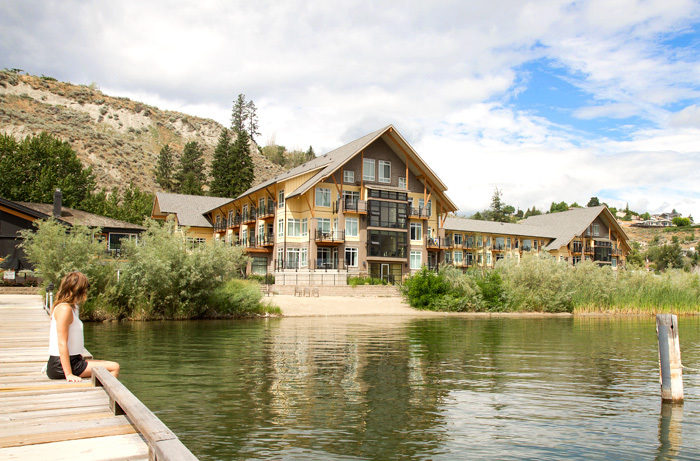 This place definitely does that and although it is luxurious accommodation, I felt like we were still getting that natural lake getaway that I love so much. We seemed to have chosen the one weekend that had not-so-great weather, but luckily we were there primarily for the wine so it didn't really phase us. Also, the wind and rain seem to have cleared up all of the smoke from the forest fires we've been having so I really can't complain. On the morning that we took these shots, the sun came out for a little while and man was it hot! I've missed that Okanagan sun and it was nice to get a small peek at it. We were heading out to do some wine tasting right after this and to be honest, I was glad that it clouded over once again. We would have had to cancel our plans and spend the day in the lake instead! For the day I decided to go casual chic with a pair of high-waisted leather shorts and a silk crop top, paired with simple leather sandals and a statement necklace. I wanted to stay cool and comfortable while maintaining a resort-chic vibe. Keeping it simple is usually the easiest way to remain classy on a hot day and simply adding a statement necklace and beautiful bag are all you need to finish the look! Loving this entire look chica! Such gorgeous photos.